Shipyard | Beer Apprentice - Craft Beer News, Reviews, Interviews and Info. Hello again, guys. I must first apologize for not posting a review yesterday. I had to, unfortunately, make a trip to the the oral surgeon and have a few teeth extracted (not fun by the way), so I, honestly, just didn’t feel like writing a review. However, I’m back at it today and still rightfully sore, but what can you do? Got to move on I guess and not sit around and feel sorry for myself. Well. Enough about that, let’s get to the beer!!! 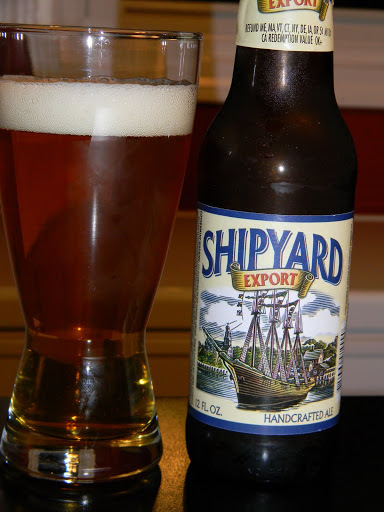 Today’s review is of the Shipyard Export from the Shipyard Brewing Company (shipyard.com) located in Portland, Maine. I have only tried one of their brews to this point, so I haven’t really formed any sort of opinion on the brewery just yet. Let’s see what the website says about this one. Shipyard Export Ale, the flagship brand of Shipyard Brewing Company, is a full-bodied ale, with a hint of sweetness upfront, a subtle and distinctive hop taste, and a very clean finish. Ok. Not much to go on there, so let’s make up our own mind, shall we? This Shipyard Export is a modest 5.0% ABV and comes in a 12 oz. bottle. From the pour, I received a clear, golden/honey color with a bright white, somewhat soapy head that had a decent size with fairly nice retention. Some ok lacing was left behind and a few patches stayed around until I finished the review. Ok, that’s not a bad way to start. In the aroma, I found moderate amounts of a bready/biscuit malt that was paralleled by a fresh grain. Neither aroma was over the top, but rather subtle, consistent and balanced fairly well with one another. A touch of lemony citrus in the smell is accompanied by a very light hint of sweet caramel. It smells clean and fresh, but after a few minutes the the bready/biscuit malt wanted to take the reigns and showcase itself more as the dominant attribute. As I took a sip, the first flavor I found was of a fresh grain, which was then followed by a very crisp, dry cracker profile. In some ways it resembled a fresh slice of white bread. Not too bad really. Upon the next few sips, more of the caramel and lemon citrus tried to nudge their way into the game to give it a little more complexity. Much like the smell, the taste was clean, fresh and well balanced with moderate amounts of hop bitterness. Also like the aroma, the flavor profile seemed to be a bit conservative. Plenty of complexities for a nice showing, but nothing that makes me want to kick my heels together with joy. The mouthfeel was crisp, smooth and dry. Rather refreshing too. The palate is left with not a lot of flavor after each swig though. Some aftertaste was there, but I was hoping, with this seemingly being a fresh beer, that more could have been accounted for. Overall, this is a pretty solid brew in my opinion. Not an A+ beer, but still good none-the-less. In a lot of ways it reminds me of a classic German Pilsner with the fresh grain and crisp, dry cracker tones. It’s super easy to drink and is very sessionable. Would be a great refresher for the Spring and Summer heat because it’s a non-complicated, no frills, decently well crafted beer. This Shipyard could be enjoyed by both craft beer geeks and non-craft beer enthusiasts alike. If you see it, pick it up and give it a try while the sun is out and the weather is warm. Have a few by the BBQ or after mowing the lawn. I’m sure it would fit in nicely with either situation. What other Shipyard brews would you guys recommend? Thanks for reading and I appreciate the comments!! !